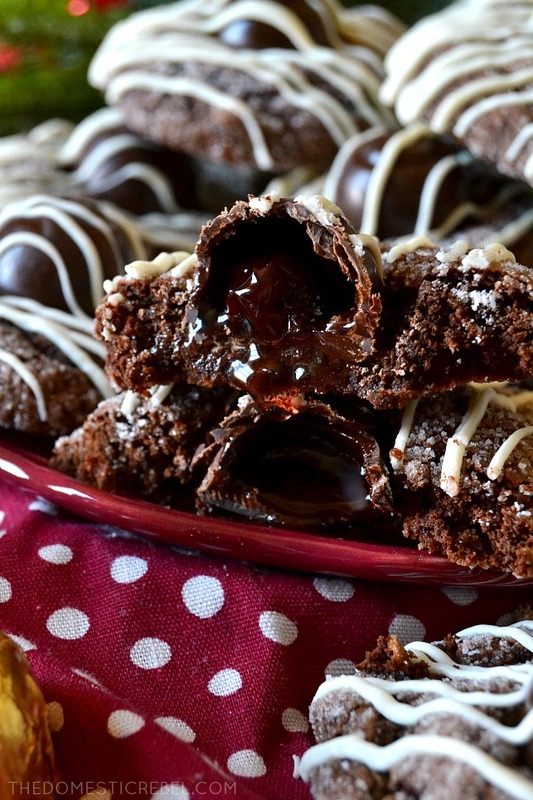 These Chocolate-Covered Cherry Cookies are fudgy chocolate cookies topped with a gooey chocolate-covered cherry candy and drizzled with white chocolate. Easy, impressive, and fantastic! I cannot believe Christmas is so close! How did this happen? If you’re like me, you probably want to bake up some cookies or treats for neighbors, teachers, coworkers, friends and family. And of course, you want to serve the BEST of the best. I feel you. I am you! Well, the wait is over. These cookies are a real winner through and through. In fact, when I purchased the cherry cordial candies at Trader Joe’s, they CARDED ME. That’s how boozy these little devils are. OMG! However, Queen Anne cherry cordials are booze-free, thus making them safe for kiddos. But if you want to get sloshed on cookies, by all means – use the Trader Joe’s version! 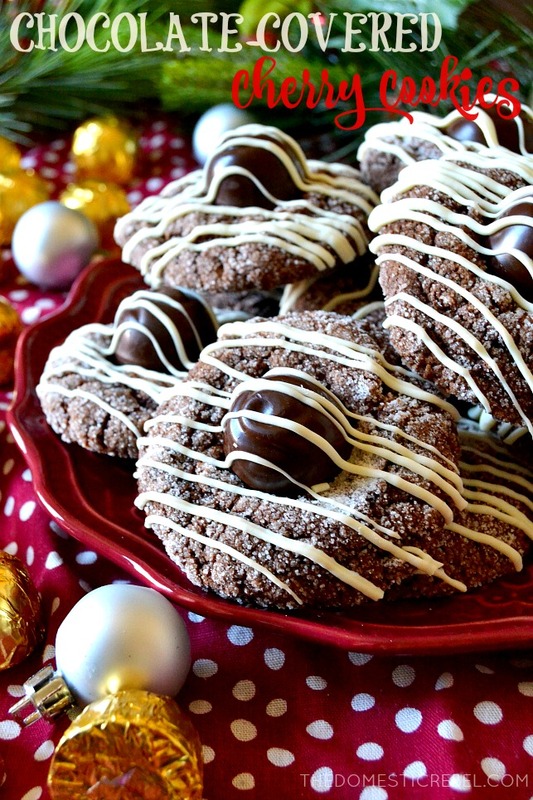 The cookie is the same recipe as these Easy Chocolate Crinkle Cookies. When I was developing this recipe, I knew I wanted the same cookie recipe base because it was so supremely fudgy, chocolaty and perfectly chewy. 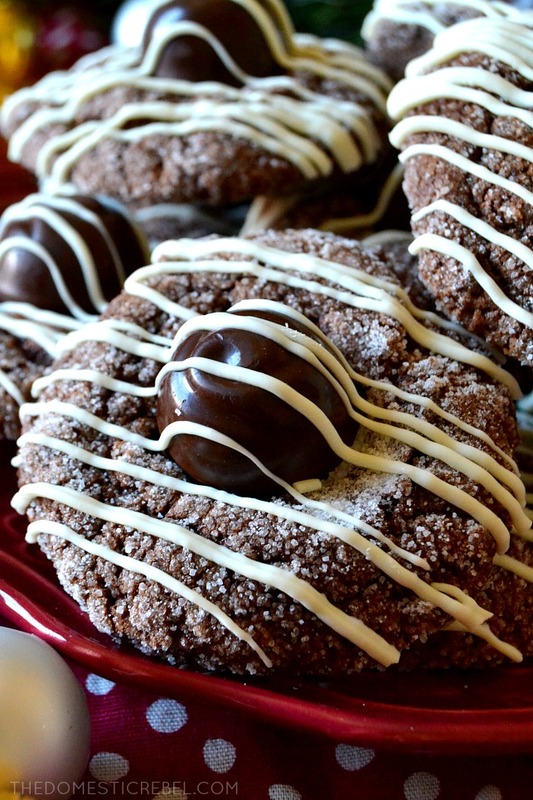 However, unlike the crinkle cookie version, these aren’t rolled in confectioners’ sugar – only granulated white sugar for a little crunch and crackle. And I also added kirsch into the batter. Oops. After the cookies bake, you’ll wait a few minutes so they aren’t so scorching hot… and then you’ll stick a cherry cordial in the center. The hardest part is to wait for everything to set and cool before drizzling each cookie with a healthy dose of white chocolate. 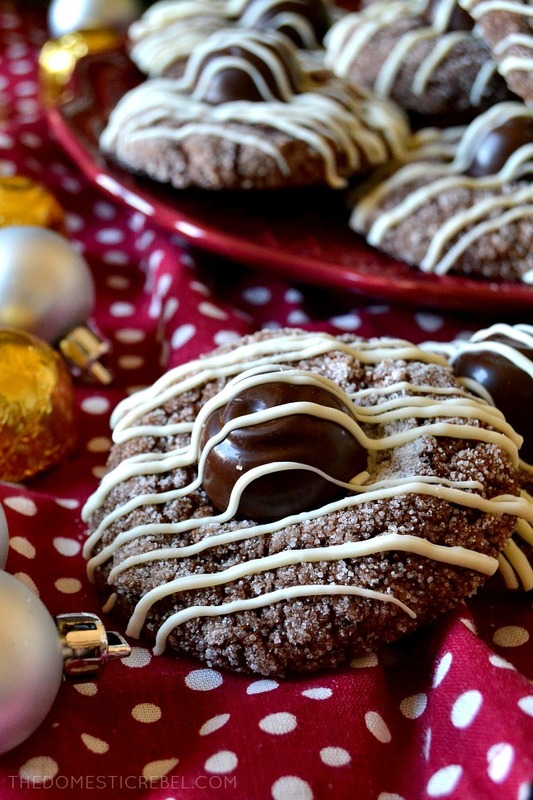 Now get these on your cookie trays! 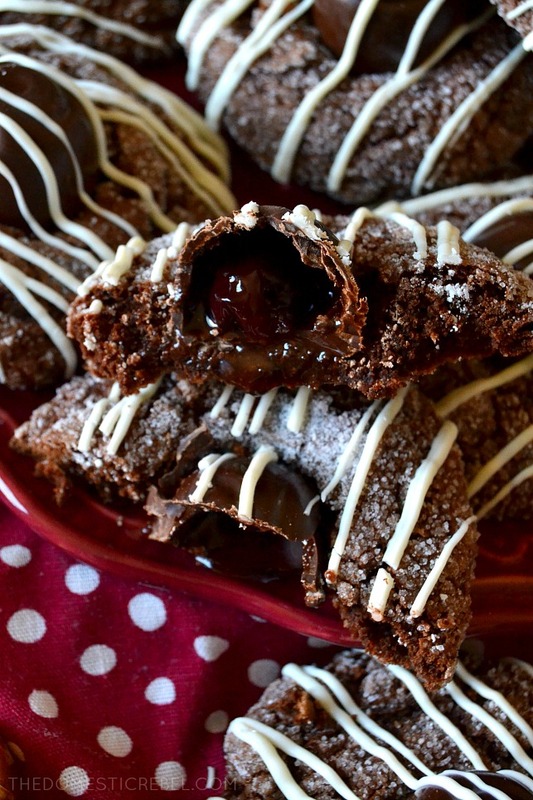 These Chocolate-Covered Cherry Cookies are so fudgy, delicious and packed with flavor! With a hint of kirsch in the dough and a gooey cherry cordial in the center, they're an easy, impressive cookie everyone will love. Preheat oven to 325 degrees F. Line 2 baking sheets with parchment paper or silicone liners. Set aside. Meanwhile, in a medium microwaveable bowl, combine the butter and chopped bittersweet chocolate and microwave for 60 seconds, stirring until melted and smooth every 30 seconds. Cool briefly, about 5 minutes. In the bowl of a stand mixer, cream together the brown sugar and eggs until combined. Add in the vanilla extract and kirsch, if using. Pour in the melted chocolate/butter mixture and mix to combine. Lastly, add in the flour, baking powder, baking soda, and salt until a sticky dough comes together. Let the dough sit, undisturbed, for 10 minutes. Scoop rounded Tablespoonfuls of dough using a cookie dough scoop and roll the dough balls into the granulated sugar. Place 1-2" apart on the baking sheets. Bake for approximately 10-12 minutes, rotating pans halfway through baking time to ensure even cooking. Cool on the baking sheets for about 5-7 minutes, then press a cherry cordial candy in the center of each cookie. Cool completely on the baking sheets. Just before serving, melt the vanilla candy coating according to package directions or until smooth. Drizzle evenly over the cookies. Fudgy and chocolaty with a burst of gooey cherry candy in the center makes for a seriously delicious cookie recipe! I’m hypnotized by their beauty! These remind me of a cookie my mom made at Christmas when we were little, hmmm, perhaps time to revisit that! These look great! ho sad that my Trader Joe’s does not sell boozey things! I was thinking this cookie dough wrapped around a hershey cherry cordial kiss, but now I will have to think on it some more. Thanks for all your great recipes, Happy Holidays! I’m going to be thinking about these cookies all day! One of my favourite weekend activities is trying new cookie recipes. I’m in!